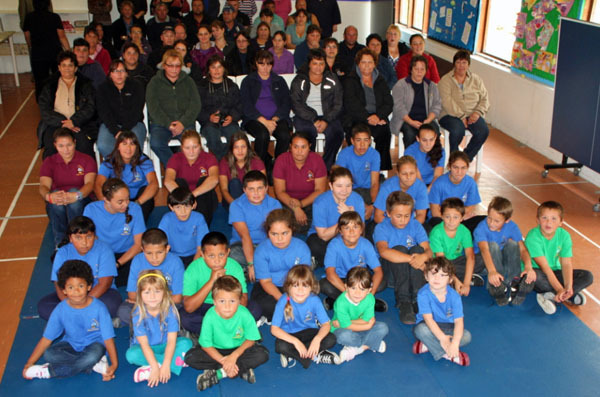 Photo report of the open day held at St Mary's School, Tristan da Cunha, held on the 1st May 2014. 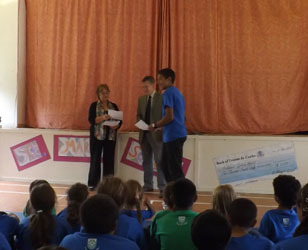 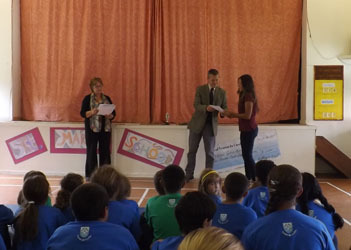 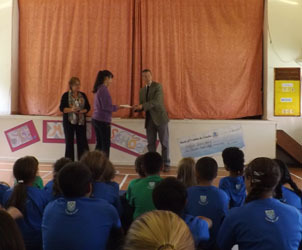 The Open Day started after lunch with a presentation of prizes and certificates. 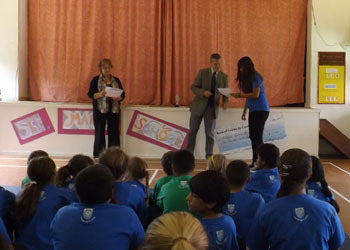 Over 35 parents/relatives attended the ceremony and then had an opportunity to go round all the classrooms looking at the resources we use, attractive displays that both pupils and staff had worked hard to produce and their children's work. 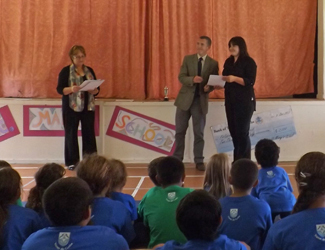 They also had an opportunity to talk to the teachers about their child's progress. 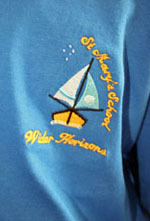 Right: Logo on the front depicting a longboat and the words 'St Mary's School and Wider Horizons'. 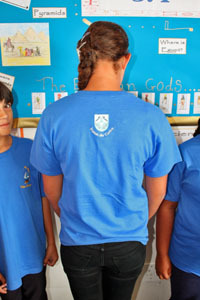 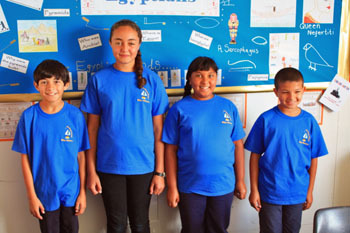 Every child was given a T shirt with the school logo and these were worn for the first time on the Open Day. 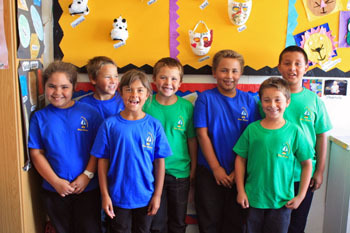 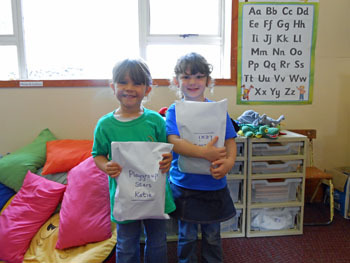 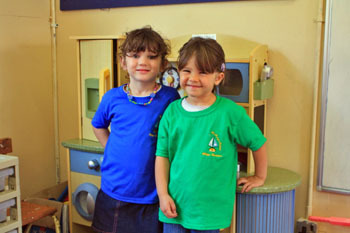 Pupils will keep their T shirts and wear them on any special school occasions. 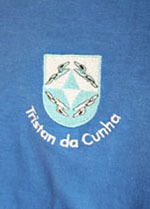 The school also has a stock of polo shirts and fleeces with the school badge that will be offered for sale to pupils and friends of St Mary's school. 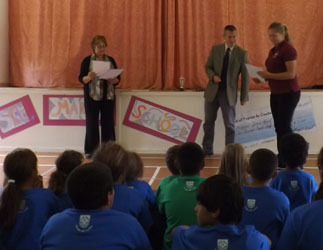 The logo with the motto 'Wider Horizons' was designed by Kimberley Green and Leo Glass who are currently in Class 5. 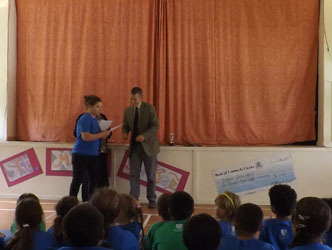 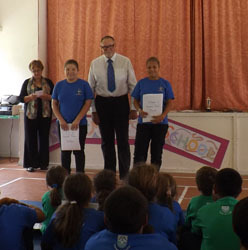 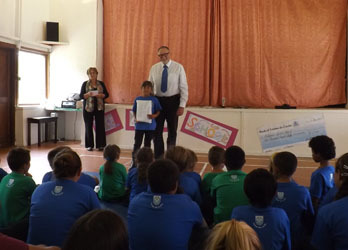 Mr Jim gave prizes to pupils in each class who had accumulated the most number of reward points in the term. 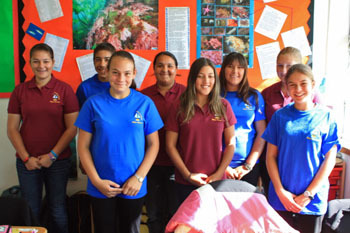 Pictured are Shannon Class 2 (above left), Chloe Class 3 (above right), Kaitlyn and Janice (equal points)) Class 4 (below left) and Rhyanna Class 5 (below right). 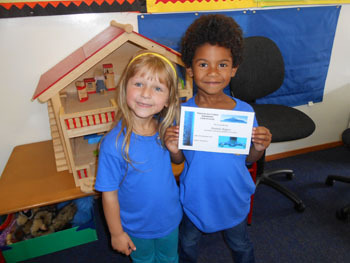 Other winners were Calvin Class 1 and Alexi and Katie from the playgroup who had equal points. 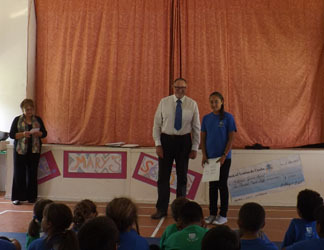 Alex Mitham first presented Lynette Green with her IGCSE Certificate in Maths and English and her Tristan Studies Certificate. 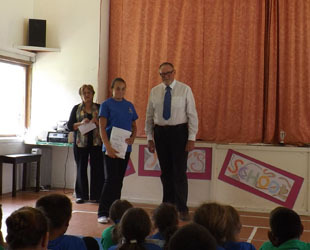 Lynette achieved good grades in these subjects. 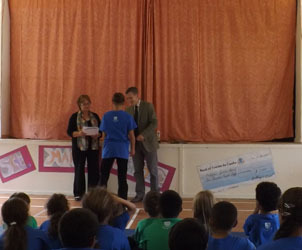 He then presented ECDL Certificates from BCS The Chartered Institute for IT. 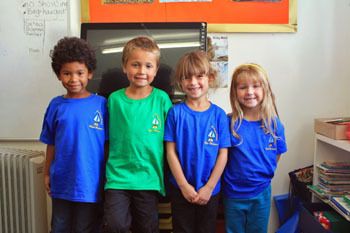 Kelly Swain, Jade Repetto, Kaitlyn Hagan and Lynette Green. 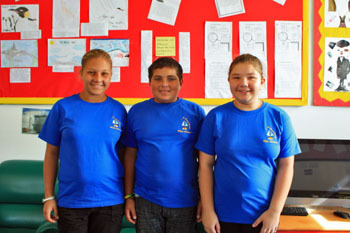 and students Riaan Repetto, Dean Repetto, Kimberley Green and Janice Green.